In the inaugural Children’s HealthWatch Report Card on Food Security Among Young Children, we focus on the millions of children in families experiencing hidden food stress, technically referred to as marginal food security, who face health and development risks. This report card is the first in a series of bi-annual publications spotlighting food security among families with young children. This series not only tracks our nation’s progress toward ensuring all families have enough resources for reliable access to enough nutritious food to support healthy, active lifestyle, but also presents evidence-based recommendations for improving young children’s health. The first report card reports trends in food security. Future report cards will focus on progress in reducing prevalence of food insecurity and hidden food stress, and related health consequences from year to year. From 2007 to 2015, hidden food stress remained a significant problem, fluctuating between 1 in 6 and 1 in 7 households with young children according to Children’s HealthWatch data. These families have not previously been tracked in national data. This hidden food stress was layered on top of a trend of generally increasing food insecurity. Household food insecurity increased drastically from 8.5% in 2007 to 15.6% in 2015 after reaching a high of 17.3% in 2014. Child food insecurity has increased from 8.3% in 2007 to 10.6% in 2015 among households with young children. What is “food security” and how is it measured? Food security refers to a family’s ability to reliably access enough food for all family members to live healthy, active lives. The gold standard for measuring food security is United States Department of Agriculture’s Food Security Survey Module, which is an 18-item questionnaire that measures a household’s ability to purchase enough food for all members. Households categorized as food insecure have inadequate access to food for all family members, which leads to the harsh reality of adult family members needing to cut the quality or quantity of their meals. In the direst of circumstances, families who do not have enough resources for food are forced to cut the quality or quantity of their children’s meals, a condition known as child food insecurity. To be categorized as food insecure in national datasets, families must affirm three or more questions related to their ability to afford enough food for all family members to be household food insecure and two or more child-specific questions to be categorized as child food insecure. Families who affirm one or two questions are categorized as marginally food secure, but included in the food secure category in national reporting. These families who express concerns about affording enough food are hidden even though they and their children are at-risk for negative health outcomes. In this report card, we refer to marginal food security as “hidden food stress”. Realizing the negative impact of food insecurity at even low levels, Children’s HealthWatch validated the Hunger Vital SignTM, a two question screener asking about food security, which can be used as a clinical tool to help identify families that are concerned about affording enough food and at risk of household or child food insecurity. Acknowledging the child health risks associated with hidden food stress and food insecurity, the American Academy of Pediatrics and others recommend screening families using the Children’s HealthWatch Hunger Vital SignTM and connecting those who are at risk of food insecurity to necessary resources. Reducing the stress families experience when they do not have enough resources for consistent and healthful access to food requires a deeper understanding of the issue and comprehensive policy solutions that alleviate economic hardship and empower families to become and stay food secure. Report nationally on marginal food security, including from data collected by the USDA. Currently, families who are marginally food secure are categorized as food secure. 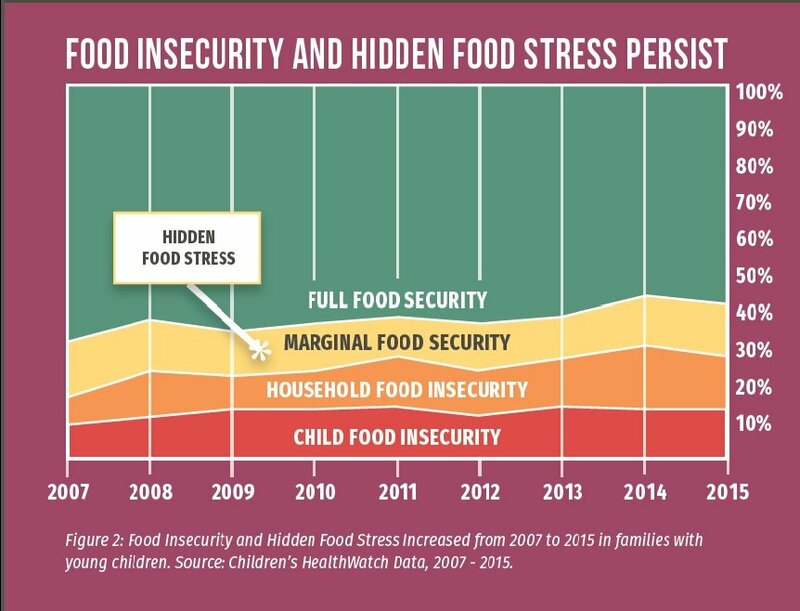 Given the negative outcomes associated with marginal food security, these families should be counted separately from food secure families in order to better understand the magnitude of the issue and identify solutions for reducing food stressors among this population. Help those who can work to find good jobs through effective job placement programs, and ensure those who cannot have the resources they need to be food secure. Ensure workers earn sufficient wages and are able to access assistance programs, when needed, to consistently afford household expenses, including food, housing, utilities, and child care without having to worry about making trade-offs between basic needs. Subsidize healthful foods and make fresh, affordable foods widely available through the establishment of food trusts and healthy food prescription programs so families are not forced to cut the quality of food when resources are scarce. Increase the SNAP benefit to reflect the real cost of a healthy diet by setting benefit amounts based on the cost of the USDA Dietary Guidelines for Americans in line with recommendations from the Institute of Medicine. This report card series is made possible through generous funding from The JPB Foundation. Children’s HealthWatch would like to thank Heather Hartline-Grafton, DrPH, RD from Food Research and Action Center, Kate Scully, JD at the Center for Hunger-Free Communities, Steve Holt, and Regina Maruca for their thoughtful feedback on this report card.